As you know, Leads 2 Business is keenly focussed on smarter ways to do and create business opportunities.This approach is not just about the information we deliver to you, but an integral part of our business ethos. Each month we capture literally thousands of tenders, yes, you read it correctly, THOUSANDS! With this much tender information being pumped out on a daily basis, we have to find a smart and effective way to prioritise researching the subsequent tender awards. Every Tender we send to you has an option to be monitored. or assign it for follow-up within your team. a priority flag back to the research team for follow-up. It then becomes very important for you to monitor a tender! Monitoring a Tender can be done from selecting a recipient from the drop down box “Assigned to” on the tender. 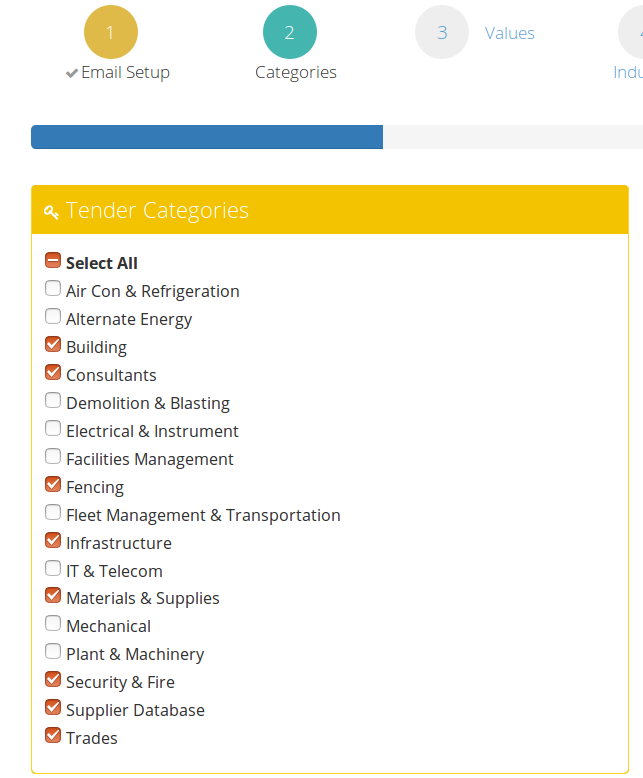 Alternately, it can be done in bulk from the search results page first selecting which tenders you want to monitor, followed by “Actions”, “Monitor selection”. 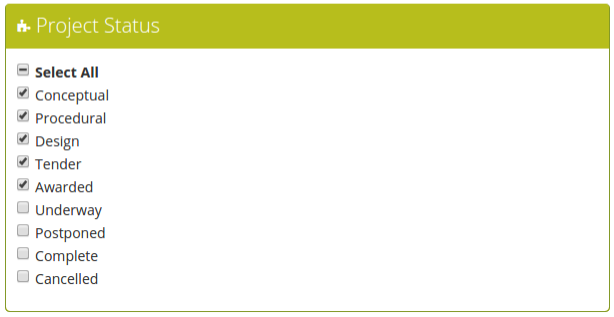 It will then present the same list of recipients as is available from the individual tender view pages. 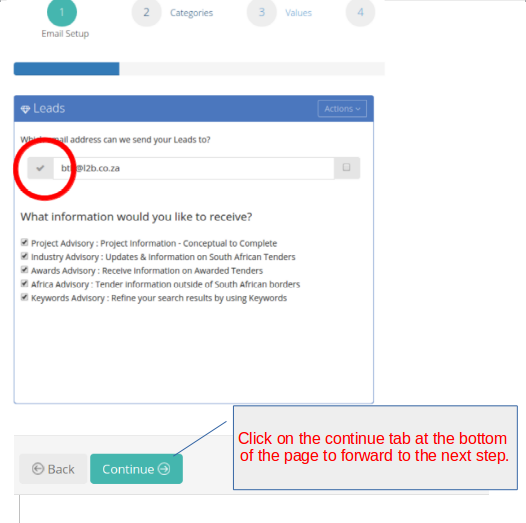 In the event you have not monitored a tender but still need the award information and the tender is now closed, you can email your request through from the tender page by clicking on “Request Award Information” button and someone from our research team will then follow up with you. It may be seemingly obvious, but a valuable subscription to Leads 2 Business is a smart, streamlined approach. We shoulder the cost of a research team and send you what is important to your business. Making sure your profile on Leads 2 Business is tailored appropriately to your business requirements so that you get the lead information. Your Advisory Settings Profile explicitly dictates what is received in the Daily Advisory email. Go through the daily Advisory email thoroughly each day. View the full details online. Monitor & Request BoQ/ SI register/ Bidders Lists as soon as possible. Email the researcher, if there are any discrepancies that you identify or if you need assistance. Keep a record of DTA numbers, instead of partial descriptions. This helps when searching. Details Change:The details pertaining to the original tender have changed, please review the new details supplied in our notification. Short Lead: This means there is a very short lead time or a very short time within which you can respond to this tender opportunity. Awards: After the closing date, all the tenders are checked for basic compliance with the tender regulations. Non-compliant tenders are disqualified. The compliance of the products or services offered and the price is considered. Then all compliant tenders are listed in order of price. Those in the lowest price tender list are in the lowest price group. Preference points are given to suppliers on the list of lowest price tenders are first verified. Preference points are only awarded after the most expensive tenders have been excluded, as this makes the process faster and fairer. Those with verifiable information come out with the best preference points and are therefore awarded the contract. Re-tenders: the issue of a second or subsequent request for tenders on a proposed contract. Withdrawals: the contract has been withdrawn and there is no longer an opportunity to tender at this time. Cancellations: the contract has been cancelled and there is no longer an opportunity to tender at this time. I am a lover of marketing, customer centricity and the art of influence. Being able to effect this through analysis, content and front end design is part of my work, my great love of creatively solving problems that reach across as many parts of Leads 2 Business as I can. Description: Department of Public Works and Roads Mmabatho invites tenders for Construction of Marikana Secondary School. Site Inspection: A compulsory clarification meeting with representatives of the Employer will take place at Corner Rose Avenue And Boikhutso Street Next To Marikana Primary School Coordinate S 25″42’30’S 27″28″2552″E on 02 March 2017 starting at 10:00. Restrictions: It is estimated that tenderers should have a CIDB contractor grading of 8GB. Preferences are offered to tenderers who 8GB or higher. Telephonic, Telegraphic, Telex, Facsimile, Emailed and Late Tenders will not be accepted. Tenders may only be submitted on the tender documentation that is issued. Requirements for sealing, addressing, delivering, opening and assessment of Tenders are stated in the Tender Data. I have been with Leads 2 Business for 5 years and absolutely love working for such a dynamic company. I started off as a Content Researcher in the Tenders Department before being promoted to Customer Relations. There are a variety of approaches when it comes to tenders in the building and construction industry, that can drum up business. The most obvious is the direct approach by the main contractor. You tender. Tendering can be costly and time consuming as your company is competing with other companies for contracts. To increase your chances, be thorough and conscientious. Everything starts with the tender notice and ends with the tender notice. Contact the relevant professionals and ask for clarity on any aspect of the tender notice you are not sure of. If meetings are scheduled, attend them timeously. If there are any discrepancies in the tender documents, query them. Comply with the instructions in the tender document, to the letter. Ensure your signed and completed tender document is handed in at the correct time, at the correct place on the correct day. And hopefully, you’ve dotted the i’s and crossed the t’s, your company is the awarded company. Another approach is sub-contracting. Main contractors require prices for their Bills of Quantity (BoQ), and they’re going to get them from sub-contractors. If you are a subbie, ensure your prices are competitive. Communicate with the main contractor and build that relationship and let the main contractor know about all your services and your products as they might not need you now; but they could need you later. Even if you can’t price that particular BoQ, still maintain that relationship. Subbies don’t need to wait for the main contractors to approach them. 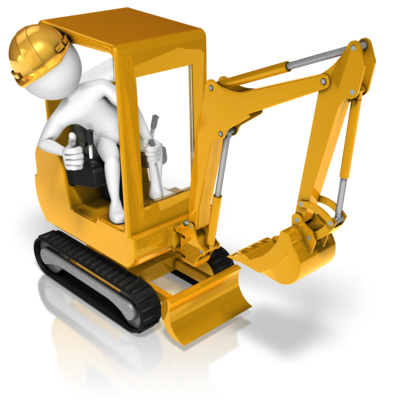 You can approach the main contractors, and just keep your company services and products alive in their minds. Once the tender has been awarded; the subbie can approach the awarded company and remind them of their prices and services. In the context of Leads 2 Business, knowing what tenders are out is the first stepping off point. Ensure your Advisory is set up to meet your company needs. Go through your Advisory email each day and follow up on any tenders of interest. Tenders are time sensitive so any delay can be incredibly counter productive. As a main contractor, you could monitor the tender to ensure that you are notified of any changes to the tender notice. As a subbie you would monitor the tender to ensure that you’re notified of when it is awarded, so that you can follow up with the awarded company. You can request a BoQ, to check whether any of your services or products are specified. You could also request a site attendance register, so you can approach the other companies that could possibly be tendering and with the help of the BoQ know what items need to be priced. Exposing your company to as many in the industry as possible, can only bring benefits. Ensuring your company is listed on the Directory, also adds to the advertising of your company and will expose your company to those that seek your services. There’s almost no end to the amount of work and opportunities available as you go along the supply chain for building tenders. DTA 616422 – Mount Fletcher Magistrate Office: Condition Based Maintanenance. CIDB 7GB. Welcome to the 1st edition of a new supplement we are adding to our weekly Blog called “Did You Know”. We will use this insert to either teach you something new or refresh your memory on something old, but still interesting to know ;). Simply put, your Daily advisory is all the leads we send you on a daily bases, according to the filters YOU selected. So, Did You Know – you can adjust your Daily Advisory whenever you like? well, you can and this is how! Once logged in – Hover your cursor over your Name, this will bring up a drop down menu as illustrated in the below diagram. There are 7 Consecutive Steps you need to follow. This is the email you have indicated to us as the one you want to receive all Advisories on. The Tick indicates that this email address has been verified, If you did not receive a verification email or if it got lost – you may click on the Action tab and resend the verification email to yourself. This is where you decide exactly what leads you are wanting to receive. First lets go though the Tender Categories – you may select as many or as few of these as you like. *Please be advised that if you opted out of receiving an Industry Advisory in the previous step, you should not have anything selected here. Project Categories: Often large developments have both a building and infrastructure element and because both of these elements may not interest you, we have given you the power to choose whether you would like to receive updates on both or just one. Project Status: These are the various stages in which a Project moves through from Conceptual right up until Completion. Once again, we don’t see why you should receive information that is irrelevant to what you do, so here you get to decide what stages of the Project you would like to receive. * Please be advised that the last two options will not be available to you, unless you are a Private Projects Subscriber. OK so lets move on. 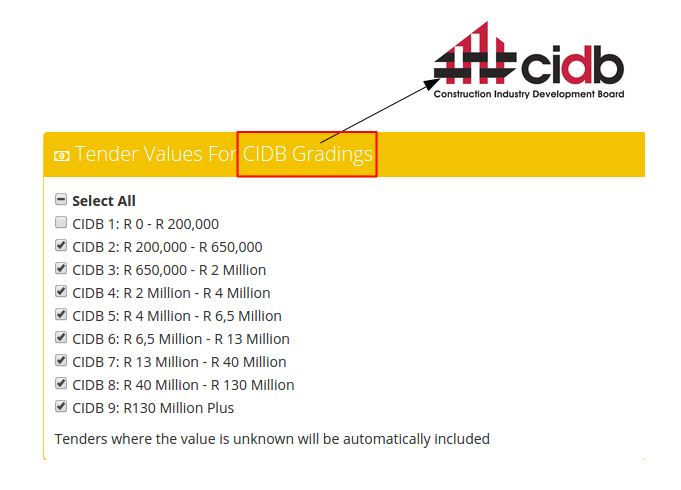 If you have a CIDB Grading you can be quite specific here, however if you are, for example, a Consultant and don’t require a CIDB, you should still select all, as there will be instances where a tender is Turnkey and there may be a CIDB requirement for the contractor all on the same tender. The Project Values refer to the size of the Development, here you may decide which size Projects would be of interest to you . 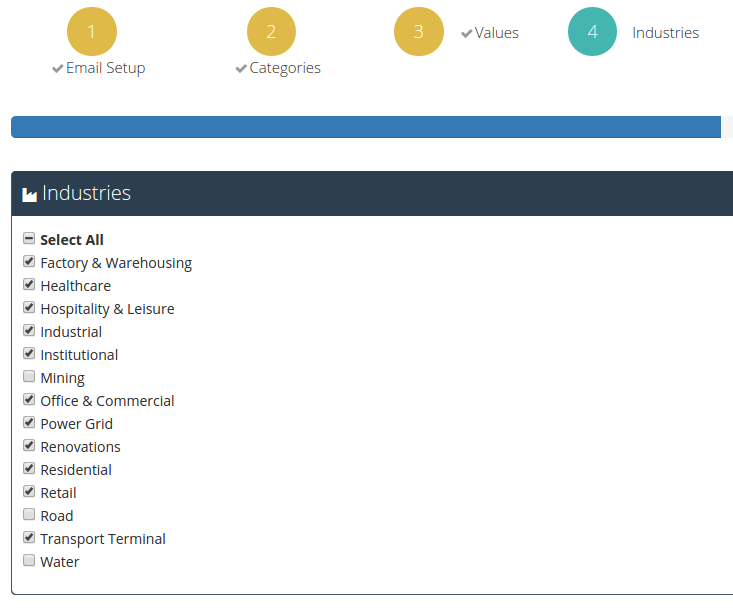 Now this is two fold, firstly if you have Tender Categories selected, here you get to be specific about the industries you service. 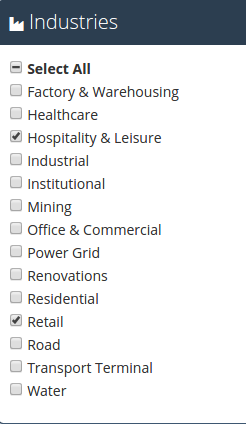 * Please note that without an industry selected, your selected Category will be deemed null and void. 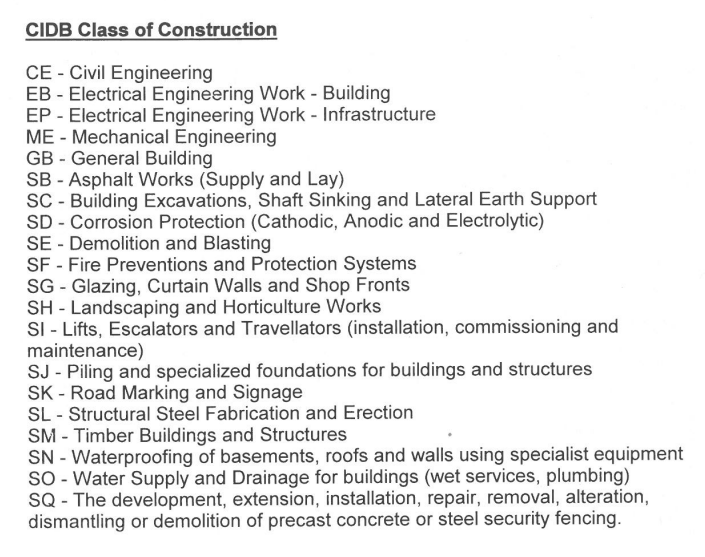 OK so that covers the use of industries for your Government Tenders, now to explain them in Projects. 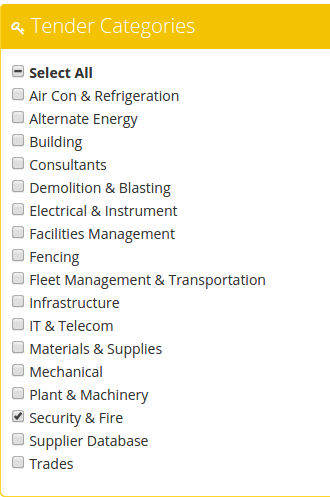 So now lets say you selected only Building, you can now use the industries selections to tell us in what industry you would like to receive Building Projects ….. are you still with me? You would not select anything pertaining to Infrastructure, for example Roads or Water. Daily Tender SA – You may Select as many regions under the South Africa selection. 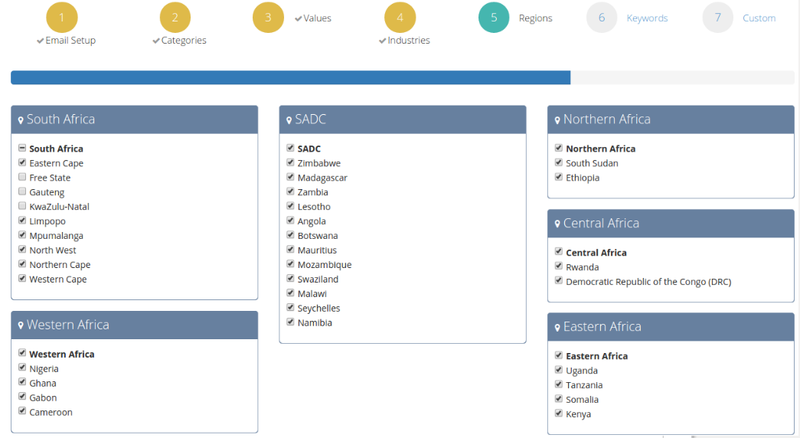 Daily Tender Africa – You may select any of the Non South African Regions. Daily Tender SA +Africa – You may select from all the regions available. Private Projects – You may select from all the regions. This is your fail safe step, this ensures you miss nothing! 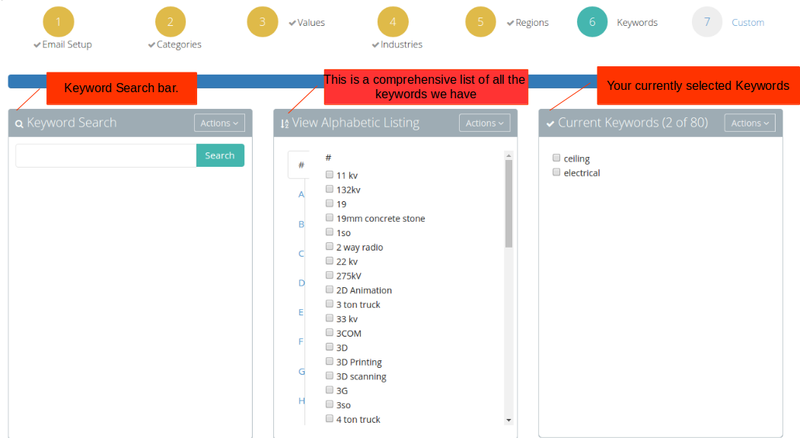 First search for your keyword, then Select the keyword and by using the action tab, click on the add Keyword drop down. And just like that you have added your first keyword. 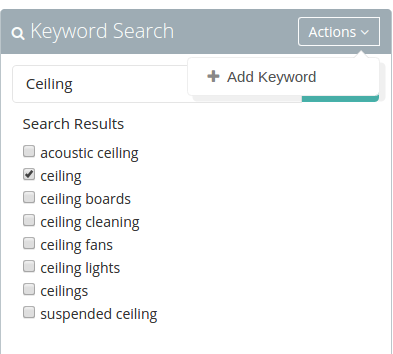 You can select multiple words and add them to save time:) – You may select up to 80 Keywords. By ticking this option, we will still send you an advisory even if there is a day whereby your filters don’t match anything we have updated or published for that day. If this option is ticked and you DON’T receive an advisory on a particular day – give us a call so we may see what the issue was. 8. Automatic Monitoring saves you from having to go through Projects and having to monitor them yourself. 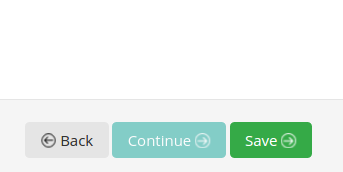 By selecting this option, the system will automatically monitor all Projects published that match your filters. And that is our walk through your Advisory Setting :). Of course if you are still unable to do this yourself, you are always welcome to contact your Account Executive or call Head Office for assistance:). "You have to do everything you can, you have to work your hardest, and if you do, if you stay positive, you have a shot at a silver lining." from: Silver Linings Playbook. Like most things in life, knowing is half the battle. If you don’t know about a potential tender or opportunity, your option to take advantage and pursue it has been removed. To ensure that you’re always in the know, at least with Leads 2 Business, your Advisory Settings need to be set up to meet your needs. Leads 2 Business hinges on two parts; the daily Advisory email and the website (www.L2B.co.za). The Advisory email is sent out each afternoon and delivers that days’ information straight to you. The email is based on the your Advisory Settings, so it stands to reason if the Advisory Setting isn’t set up satisfactorily then the Advisory email isn’t going to meet the your needs. Our subscribers have two complaints concerning the information we provide; there’s too much and there’s too little. Understandably this is a very precarious line to walk. Too little runs the risk of missing pertinent information; and too much means an information overload. I tend to favour ‘too much”. Better I decide what’s best for me rather than have someone or something else do it for me. But that’s just me. To reach a happy medium, is a combination of training (given by L2B staff), communication on the part of our subscribers (telling us what you want/ need & expect) and working through what you receive each day. You have full access to alter and update your Advisory Settings at any time, so if your company has expanded or diversified in some way; it follows that your Advisory Settings need to be updated to meet the new changes. The Advisory is sent out each day. This is extremely important because time is money. The earlier you are aware of a potential tender notice or new project; the more time you have to prepare for it. The Leads 2 Business website is where you work through the information you’ve received. The most important aspect would be the ability to Search. The Search is now a global search, meaning one search field searches through our entire database (Private Projects, Daily Tenders, Directory and News). From this you can filter down further and get more specific. Why search when you receive the Advisory email? It’s a good safety net. It allows for the Advisory email to be super specific (so you aren’t scrolling for days), and the searches to be very general. Reaching that happy medium spoken of above. You even have the ability to “Dismiss” a tender from your search result should it not be what you are looking for, and never have to see it again. My advice when searching? Always ensure you’ve got “Newest” selected. L2B has been around for awhile, and information is our business, and we have a lot of it. “Newest” ensure the most recent results appear first. Once you’ve found a tender you are interested in, whether tendering directly or subcontracting, you have the ability to Monitor the tender notice. Once you’ve Monitored a tender notice, you will receive updates on that particular tender notice, should there be any. Examples of these updates are addendums: changes to site inspections and closing dates. When documents are attached (for example: Site Inspection and Bidders Lists), you will be notified. These are helpful for pricing and subbies. Then you’ll be notified in the change of Status of the tender notice. Has it been cancelled or has it been retendered prompting you to go to the new tender notice. Has it been awarded, and you now have the awarded companies details. You can Monitor a tender yourself, or assign one of your Monitors (a colleague perhaps) to monitor a tender. The Monitors you add to your Profile will have access to those tender notices you assign to them. This allows you to assign potential opportunities to your colleagues and reps, and they will have all the necessary information at their disposal. Email the Researcher that created the tender notice for assistance. Request Site Attendance Registers & Bidders Lists – If there are Documents already attached, they are available to the right of the tender notice. Request BoQ (Bill of Quantity) – If there is a BoQ already attached, it is available to the right of the tender notice. What’s the point of all of these features? To work the information. There are a variety of companies out there can benefit at a variety of stages in the procurement process. 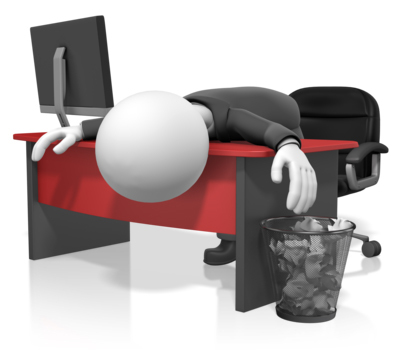 Consultants are required very early on, and sometimes through out the process. Contractors are interested in the tender stage and subcontractors and vendors can benefit from putting forward their company details even after completion. What you put in, is what you get out. To be competitive is to be in the know. That involves being pro-active in all things. 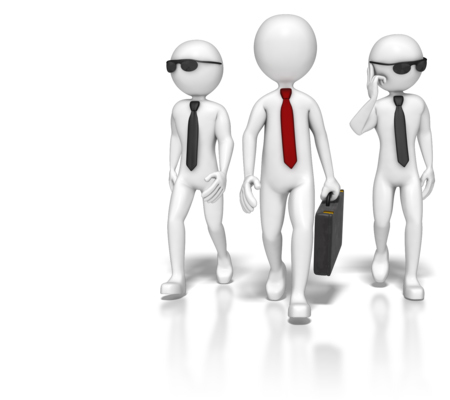 Leads 2 Business is a tool that can be hugely beneficial when used correctly. Talk to us. Training is free and there are various avenues to contact us. Email directly off of the tender notices and projects; LiveHelp allows you to chat to a L2B researcher directly; call us or submit Feedback. Suggestions are always welcome. The more we learn about the companies that subscribe to us, the more we understand how the information we provide is used. We work and learn together to keep on the right track. There is much excitement when a Project Status moves into Tender Stage. This means the project is going out to tender – tender for construction! Whoop whoop! Things are happening, construction is going to commence shortly. If, however, the Project goes out to tender for the professionals the Project Status will remain in Procedural stage as this is a tender for professional services to conduct feasibility studies, EIA studies etc. Open/public Tenders are published in newspapers and the media and these are open to general contractors who may only be limited by their CIDB grading. With publishing of the Tender notices comes site inspection dates (which are generally compulsory) and site attendance registers. The Tender closing date is perhaps the second most important date after the site attendance date. The Tender notices (DTA) that are listed on the Projects include a hyperlink which links the Project and Tender. Once the Tender has closed and the bids are in, bidders lists are then requested and if successfully obtained, the bidders list is attached to the DTA and the Project as a document. On average, it takes about 3 – 4 months for Tenders to be awarded, (but it can take longer. Much longer in Africa). Once 3 months have passed, it is time to follow up on the Tenders and see if any awards have been made and this is when the fun begins. But I digress …… back to getting the award information…. When obtaining the award information, it is important to get the spelling of the awarded company’s name correct, usually using the NATO phonetic spelling which is: Alpha for A, Bravo for B, C for Charlie etc. However, it appears that not everyone is able to recall this list when it comes to spelling and in Africa there appears to be many variations to this list, including the use of animal names – and I have had some more unusual phonetic names, including “J” …. for Giraffe and “A” for ….Umbrella!! Really!?! I have been working for Leads 2 Business, in the Private Projects Department, for 10 years this July. I am Deputy HoD for Private Projects. Researching mining projects and projects through-out the African continent are my areas of research and I find them most interesting.